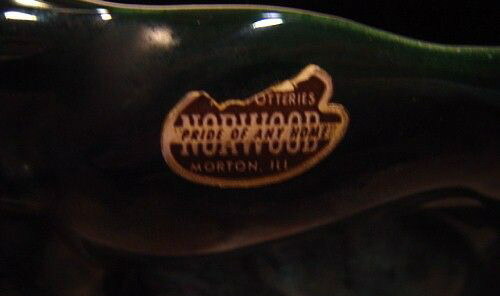 It isn't often that American Art Potteries is mentioned in TV lamp circles, due primarily to the fact that they used foil "Norwood" labels as the only form of identification on their products. Even if the label wasn't removed by the buyer, they have invariably fallen off over time. One of the pottery makers founded by the Rapp family in Morton, Illinois, they were in business from 1947 until 1963. 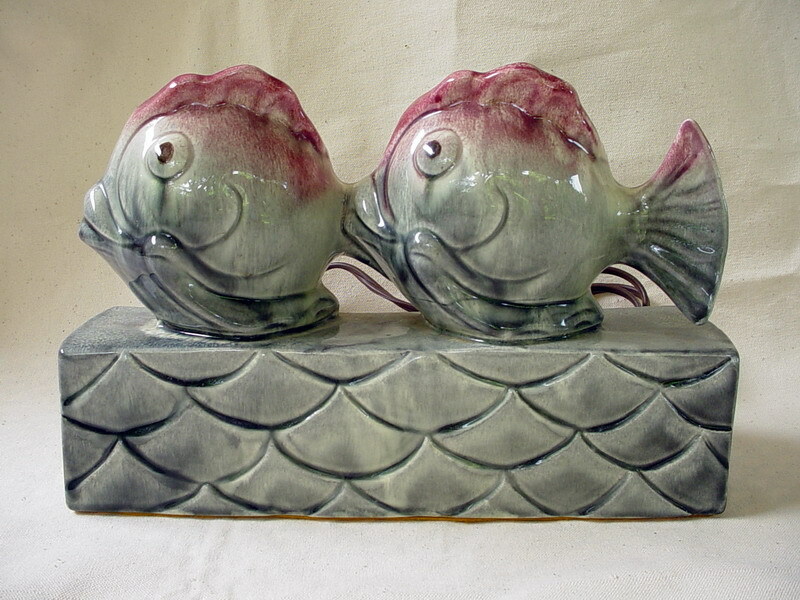 These humorous fish aren't usually found with a label, but it's said to have been made by American Art Potteries in Morton, Illinois. It can be found with many two-tone color variations. This design was also made by Texans Inc., with the only difference being in the number of waves on the base. 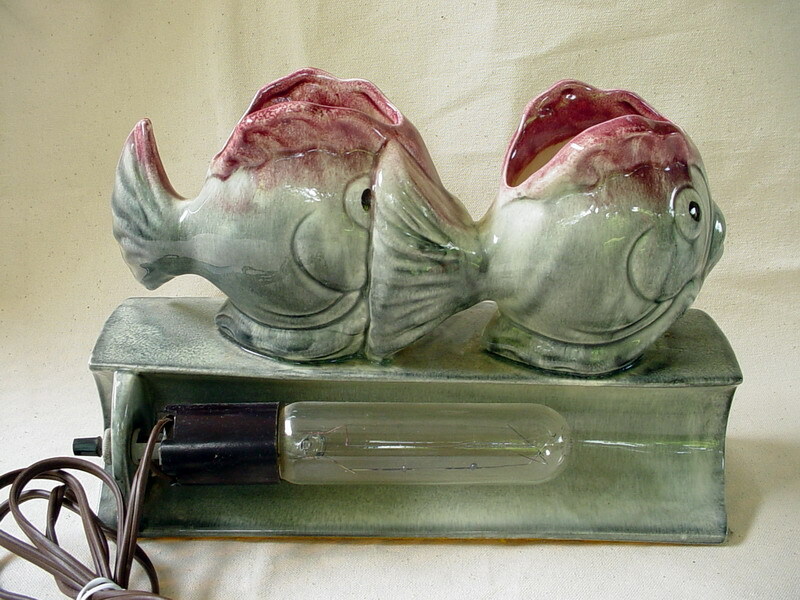 Back view of the fish TV lamp. 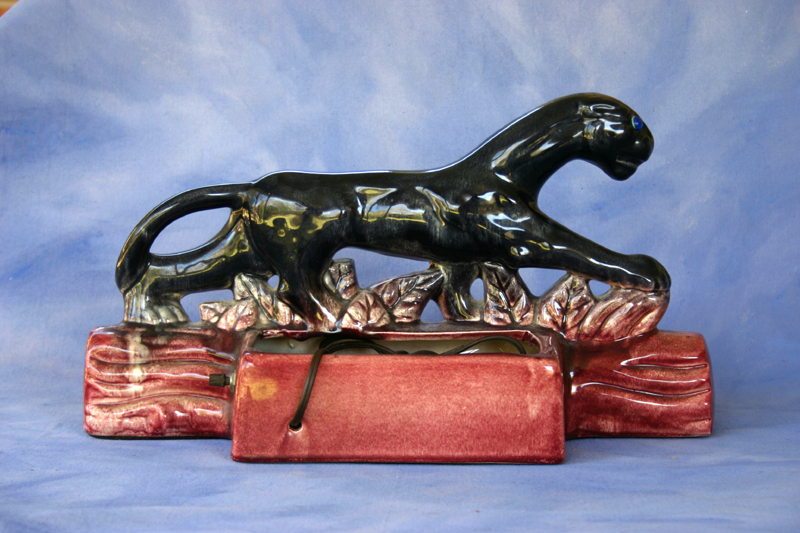 All potteries active in the '50s seem to have released a panther TV lamp, and American Art Potteries was no exception. Photos courtesy of Janet from Carl Junction, Missouri. 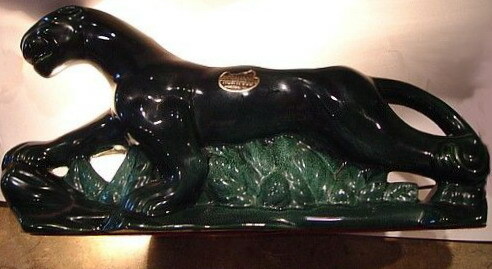 The incomplete "Norwood" label shows the panther to be from American Art Potteries. 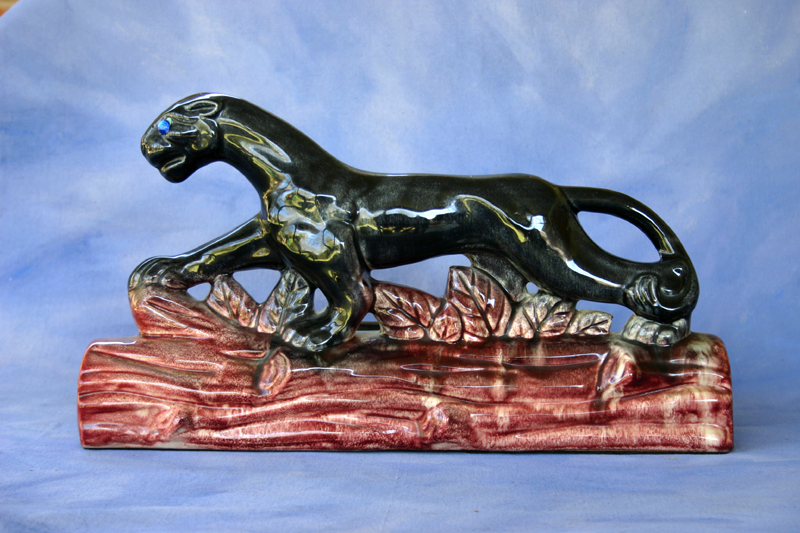 This panther is interesting as it is a variation on the one above. The panther and top part of the vegetation is identical, but this cat is striding across a log. No label is present, but given the characteristic translucent glazes and the similarity to the previous example, I can only assume that this one is also from American Art Potteries. Here's the back of the panther on a log. The bugged-out blue eyes are almost sure to be a later addition! 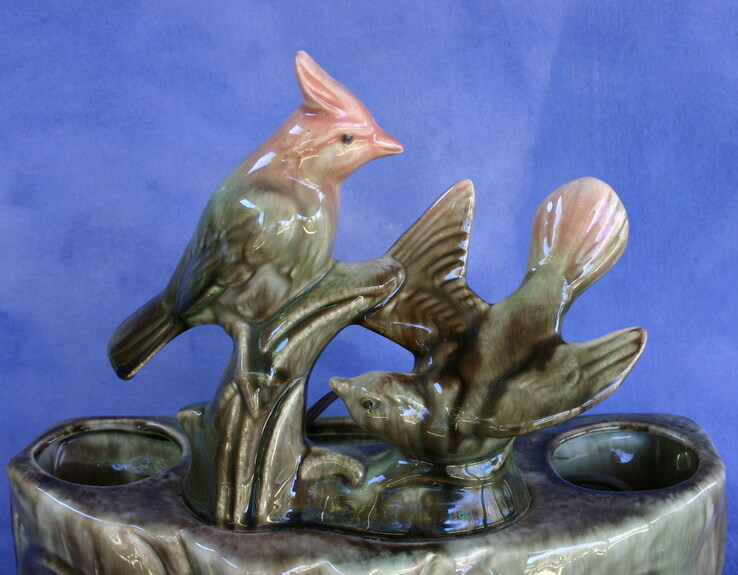 This is a frequently seen TV lamp from American Art Potteries that depicts two cardinals perched above a planter. This detail shows the beautiful blended glaze that is typically found on this lamp. 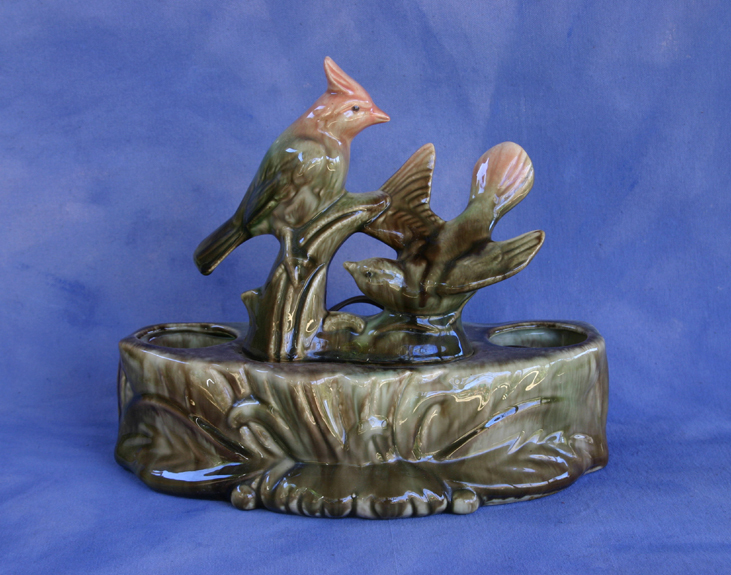 The bird figurines and planter/lamp portions were cast separately and fused together during firing. 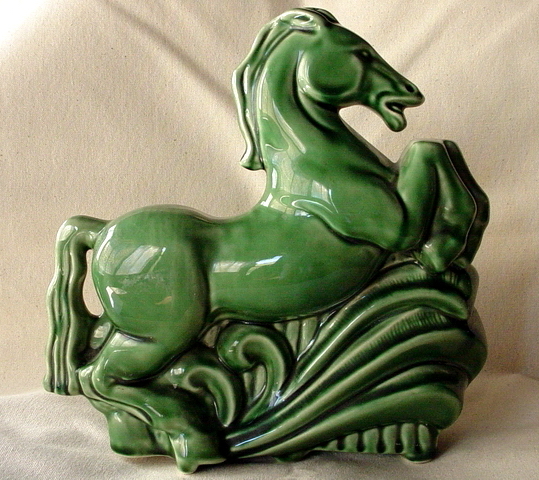 This stocky horse from American Art Potteries is also a planter, and can be found in several other colors.